See where critics claim that the blues were born, on Beale Street (www.bealestreet.com) in Memphis. Find restaurants, gift shops, boutiques, parks and nightclubs, as well as the Beale Street Police Museum and A Schwab's Dry Goods Store, a small department store which has been in the same family since 1876 and still offers old-fashioned bargains. Visit the Blount Mansion (www.blountmansion.org) in Knoxville, the 1792 frame house of Governor William Blount. The mansion is a National Historic Landmark. Visit the ancient Cumberland Plateau, which forms a natural boundary between Middle and East Tennessee. Waterfalls, deep river canyons, parks and resorts characterise this historic region. Die-hard country fans will want to visit this all-American attraction in the Tennessee hills, created by the Queen of Country herself - Dolly Parton. The park's newest attraction is Timber Tower, the first and only ride of its kind in North America. Take a trip to Gatlinburg (www.gatlinburg.com). At the base of the Great Smoky Mountains, Gatlinburg offers miniature golf courses, haunted houses, restaurants, the Ripley's Aquarium, and more. Explore the many galleries and museums which reflect Tennessee's Antebellum and plantation history, including the Carl Van Vechten Gallery in Nashville, which exhibits collections by Cézanne, Picasso and Renoir as well as displays of work by Georgia O'Keeffe and Alfred Steiglitz. Enjoy the bald eagles at Reelfoot Lake (www.reelfootlake.com), the recreational opportunities of Kentucky Lake (www.kentuckylake.org), or the quiet, sombre atmosphere of the battlefields at Shiloh National Military Park (www.nps.gov/shil). Explore the Rock City Gardens (www.seerockcity.com) in Chattanooga. The subterranean black-lit gnome dioramas and Mother Goose theme areas are constructed around several interesting rock formations. Hear good ole country music at the Grand Ole Opry (www.opry.com) in Nashville. The opry is the setting for the nation's longest-running live radio show, which moved here in 1976 (the original setting, Ryman, has been renovated and is also open to the public) and is the place to hear country music on Friday and Saturday nights. View the process of bourbon-making at the famous Jack Daniel Distillery (www.jackdaniels.com), 120km (75 miles) southeast of Nashville. Much insight into Mister Jack's famous distilling process is offered during the daily guided tours. Walk through James White's Fort (www.jameswhitesfort.org). The fort still exhibits portions of the original stockade built in 1786 by Knoxville's founder. 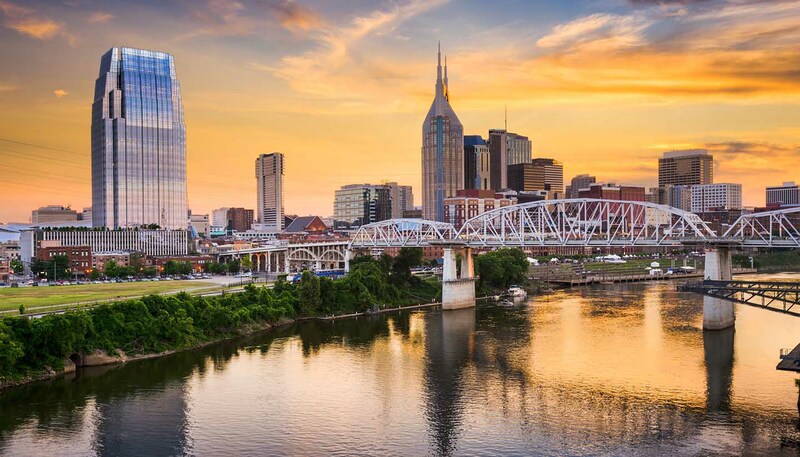 Head to 'Music City USA' - Nashville. The centre of Nashville's music industry is Music Row, around Division and Demonbreun streets. Spanning an entire city block, the Country Music Hall of Fame (www.countrymusichalloffame.com) is located in the revitalised entertainment district of central Nashville. Stay in Pigeon Forge (www.mypigeonforge.com). In addition to Dollywood, miniature raceways, arcades, Boyds Bear Country (where you can make your own bear), major shopping outlet malls and more are available. The city celebrates the culture of the East Tennessee mountains and you will find craftspeople demonstrating their skills and selling their wares. Ride the Incline in Chattanooga, which propels its passengers up a stomach-churning gradient of 72.7° - the world's record-holding, steepest passenger railway. The journey is worthwhile, especially on a clear day, when the territories of seven states are visible from Lookout Mountain (www.lookoutmountain.com). Spot marine lifeView denizens of the deep at the Tennessee Aquarium (www.tennis.org) in Chattanooga. The aquarium houses one of the world's largest collections of freshwater marine life. Experience Chattanooga's Ruby Falls (www.rubyfalls.com), a spectacular 44m- (145ft-) high underground waterfall which flows 341m (1120ft) below the surface of Lookout Mountain. Try the authentic tastes of Appalachia at the Farmer's Market, 24km (15 miles) from downtown Knoxville. The pavilion sells local produce, plants, jams, jellies, arts and crafts. Explore the Great Smoky MountainsThe largest wilderness area in the USA, this national park extends over half a million acres of the Appalachian Mountains, bordered by North Carolina and the Tennessee valleys. The park is home to bears, white-tailed deer, wild turkeys and more than 1,500 species of flowering plants. The mountains are beautiful in all seasons, but perhaps the best time to see them is in October when they are showered in colour. Pay your respects to the King Elvis Presley's beloved Memphis home, Graceland (www.elvis.com/graceland), is a Mecca to the pilgrims of rock 'n' roll. The impressive Trophy Room effectively documents his impact on the music industry as a singer and entertainer. Journey on The Delta, an indoor, quarter-mile river, complete with four 25-passenger flatboats featured inside Nashville's award-winning Opryland Hotel and Convention Center.